Outdoor Furniture Market size is estimated to surpass USD 23 billion by 2024; according to a new research report by Global Market Insights, Inc. Improved consumer spending and traveling trends resulted in an increased number of tourists across the world. These trends are mainly observed in seaside areas, hill stations, or places with scenic beauty & historical monuments, which in turn leading to increasing counts of hotels, resorts, open spaces, and public gardens. Thus, a growing number of hotels and restaurant will drive the outdoor furniture market demand. Increasing financial ability to spend on leisure & experiences is propelling the consumer spending on outdoor furniture in the residential sector. Several homeowners are focusing on enhancing the garden or balcony appearance with the aesthetically appealing sitting areas. Lounge chairs, seating sets, and table is key products generating a strong revenue in the outdoor furniture market. Choice of furniture is highly dependent upon the external climatic conditions. Excellent weather resistance, crack proofing, insect resistance, pest & fungus repulsion, and a superior tensile strength are among the key factors making it an ideal choice for outdoor furniture. The majority of the manufacturers are turning their interest into crafting eco-friendly fixtures using MOSO bamboo, which is stronger and harder than oak. Also, an enhancing outer appearance to signify matching architectural themes & style of living spaces and backyards of houses plays a major role in the purchase decision. Several manufacturers are concentrating on beach resorts and hotels owing to higher profitability achieved from these sectors. Singapore, Malaysia, Thailand, Indonesia, and Dubai are provided high growth opportunities owing to economical tourism and potential locations from tourism perspective which will attract more tourists. Outdoor furniture market from wood material will witness a CAGR at over 4.5% up to 2024. Wood is one of the popular material choices in garden furniture due to its superior comfort, eco-friendly, strong build, and aesthetic appeal. They are widely used for the production of outdoor furniture for the residential and commercial sectors. Wood based furniture is lightweight, long lasting, and offers natural and rich appeal, thereby fueling industry growth. Plastics accounted for 15% of the market share in 2017. The product is highly preferred by the economic budget consumer group, as they are lightweight material with minimal maintenance at a lower price. High-density Polyethylene (HDPE), Polystyrene (PS), Polyethylene (PE) and other polymer materials are widely utilized materials in this industry. Also, available in numerous color combinations, shades and textures are fueling outdoor furniture market demand for consumers who consistently change the home styles. Residential sector dominated the outdoor furniture market application segment and accounted for over 60% share in 2017. The increasing usage of garden furniture for decor and aesthetics coupled with the increasing household sales is supporting the segment growth over the study time frame. Outdoor furniture is used in backyards, lawns, balconies, and rooftop gardens for enhancing the overall household appeal and facilitating seating purposes. 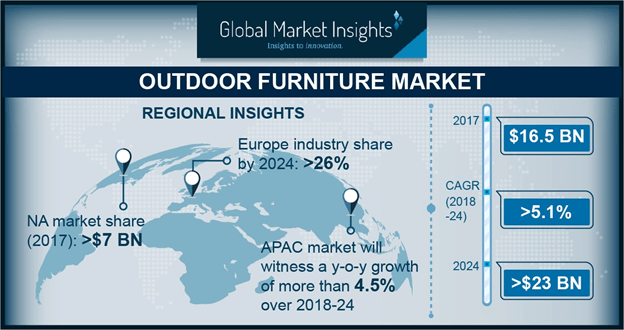 Asia Pacific outdoor furniture market will witness a CAGR at over 4.5% in terms of volume from 2018 to 2024. International tourism is gaining a strong attention in countries including China, Malaysia, South Korea, Singapore, and India. Thailand is among the most attractive tourism countries along with Singapore and China , which is mainly driven demand for the garden lounges, chairs, table sets, and other furnishing products. In 2016, Thailand travel and tourism noted over 32.6 million international arrivals with an 8.9% YoY growth. Ashley Industries, Inter IKEA Group, Century, Agio International Company Limited, Brown Jordan, Barbeques Galore, Keter Group, and Lloyd Flanders are among major outdoor furniture market manufacturers. The global industry share is extremely fragmented with a large presence of industry players at global and regional level. The manufacturers are involved in developing their supply chain network to profit from being customer friendly to capture a larger industry share to gain competitive share.